GEORGETOWN RUNNING CLUB: So tender! So tasty! On Bus. 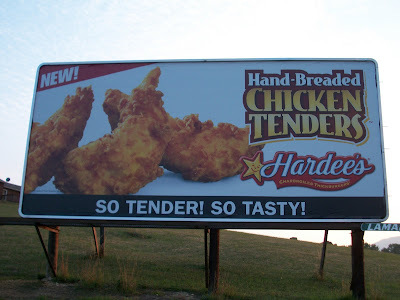 460 in Perisburg, Va.
Is this advertisement "Tender Approved"? I love you, Mr. Ban. A wise man once said: "There are never too many chicken tenders... only too few chicken tenders." CTR would probably crash his bike if he rode past this sign during a workout.